Chandoo has posted the new Microsoft Ads in Microsoft says ‘I am PC’ and it is brilliant. Contrary to my expectations, especially after the abortive Bill and Jerry spots, I enjoyed these ads. Microsoft finally has countered those insipid Mac vs. PC ads (see review in Slate), in a tasteful and clever way. Hey, I am PC too. I thought I’d see just how PC my readers are. 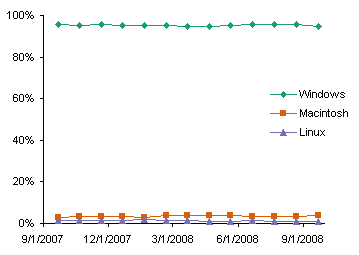 I checked my FeedBurner stats for the last 30 days, ending 9/21/2008, and here is the breakdown of operating systems. This fits pretty closely with my overall web site stats, too, which totals around ten times the traffic, but in FeedBurner it’s easier to get a quick list of numbers, and FeedBurner lists the versions of each OS. So what’s all the buzz about Macs lately? Macs make up around 4% of my visitors. 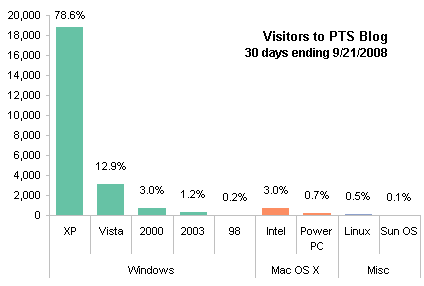 For every Mac visitor, I get more than 26 Windows visitors. What’s all the buzz about Linux? Linux counts for 1% of my traffic if I round up. Windows includes 95% of my traffic if I round down, and over 80% of that is XP. I guess the significant buzz is that under 20% of my Windows hits are from Vista. This needed further investigation, so I collected data for the months in between. 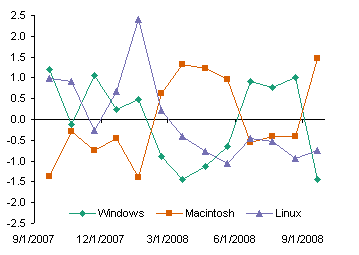 Raw visits showed a general up trend in Windows users, while Mac and Linux were lost in the weeds. On a percentage basis, Windows was up in the mid 90s, with a hint of a downward trend, and a gain, Mac and Linux were too low to resolve. 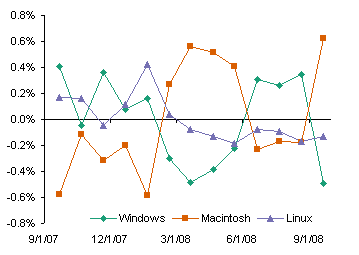 Putting the data on a log scale flattened any trend in the Windows line, while it made Mac and Linus easier to see. 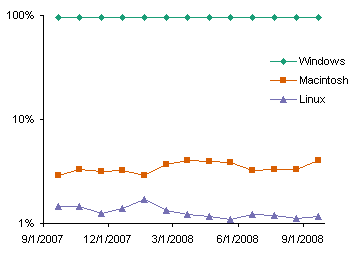 There is possibly an upward trend in Mac and a downward trend in Linux. It’s sough to call, given the fluctuation in both lines. To evaluate the trends, I added trendlines. These do in fact show slight slopes in the directions indicated above. The slopes are very small, and correspond to changes on the order of a fraction of a percent per year. The R² values are also pretty low, indicating rather poor correlations. My conclusion is that Linux and Mac make up a very small fraction of my readership, averaging 1.3% and 3.5% respectively over the past year. Sorry, guys. No offense, but this supports my decision to concentrate on Windows versions of my utilities. My utilities are built in Excel 2000 and VBA 6, and so are compatible with Excel 2002, 2003, and even 2007. However, they are incompatible with the older VBA 5 found in Excel 97 and Mac Excel. In fact, Mac Excel 2008 doesn’t even support VBA at all. Microsoft released Mac Office 2011 after this ancient article was posted. It included VBA, which had been removed from Mac Office 2008, and it had an uncustomizable ribbon to go with the usual Mac menu bar. 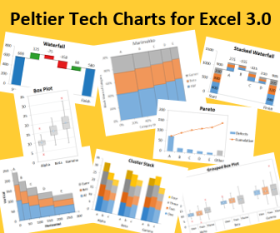 I was able to write a version of my Excel Charting Utility that is compatible with Mac Excel 2011, and includes every feature present in the Windows version. During this time, Mac traffic on my blog has increased, to over 5%, and sales of Mac versions of my software is around 10% of Windows sales. Microsoft will soon release Office 2016 versions for both Mac and Windows. I am working on upgrades to my Utility, so that one add-in will work in both Windows and Mac computers. This is not just adapting the utility to Office 2016, there are also new features being added. Unfortunately changes in the Mac OS and in Office mean that I may not be able to completely mimic all Windows features on the Mac, but I am trying my darnedest. Posted: Tuesday, September 23rd, 2008 under Statistics. Tags: Chandoo, Macs and PCs, Trendlines. I would almost argue, following your and Nicholas Bissantz’s articles on the exaggeration inherent in higher values on a linear scale, that it’s the other way round: putting the data on a linear scale introduced a spurious trend in the Windows line, which moving to the log scale corrected. This is an interesting thought. There are a couple things to keep in mind. 1. A log scale is good for comparing proportional changes. 2. 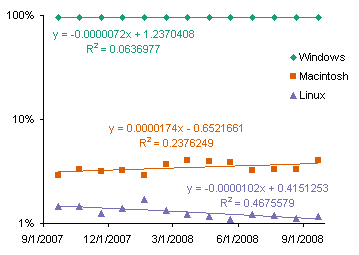 Plotting logs of percentages limited to 100% is different than plotting logs of unbounded values. 3. The percentages are not independent: it’s a zero sum game. A given change in percentage produces a different proportional change. A 1% gain by Linux is almost a doubling of the Linux percentage, but it is almost imperceptible coming out of the 95% share of Windows. I considered plotting 100% minus Windows% to put the three onto the same scale. In this data there are no comparable proportional changes. The values have comparable absolute changes. The log scale makes it easier to see the very small Mac and Linux values on the same chart with the Windows values, but it skews the changes. To be fair though, you’re writing for an MS Office/VBA audience, so it’s no surprise you are seeing mostly Windows users. People who develop applications in VBA tend to use Windows, and Microsoft has been scaling back support for that in Office:mac (and even removed VBA entirely from Office:mac 2008, AFAIK). To take another unrepresentative measurement, I got 74% Windows users, 22% Mac, 3% Linux over the last month, with the odd iPhone, iPod touch, and even PS3 in the mix (well below 1% though). A quick comparison to a year ago shows 78% Windows and 18% Mac, so I could claim that the Mac’s market share is dramatically increasing. It really depends on who your audience is, and especially when you’re targeting a particular platform, such an argument can become a bit circular. And yeah, I’m a Mac. I totally admit that my audience is targeted; see how I started my last paragraph. From time to time, though, I’m asked why my programs don’t work on a Mac, or in Excel 97. I always feel guilty when I decline to update a utility for a potential audience, particularly if it is a step backward, like Excel 2000 to 97, or VBA 6 to 5. This analysis has made me see that the numbers do not support the effort. I used to be a Mac. I wrote my doctoral thesis on a Mac Plus, my wife did hers on a Mac Plus, and for the first four or five years of my professional career I used a Mac Plus SE (the 20 MB hard drive was enormous). My reports and graphics were always the best in my group. Everyone I worked with was so jealous, because they all had PCs, and at the time (late 80s to early 90s) the situation described in the Apple ads was pretty accurate. At some point the company networked us all together and tried to standardize the computer equipment, so I got a PC. It was a little strange at first, but then I installed MS Word, I think 2.0. It was so much like Word 1 on the Mac, that I instantly was at home. I still had the best reports and graphics in my group, so people had to admit it wasn’t due to using a Mac. Since then, I’ve been a PC. BTW, Microsoft removed support for VBA in Mac Excel 2008, claiming resource limitations, but I have heard talk that it will return in future versions of Mac Excel. Here’s a different perspective: I look after the website for the computing and graphics sections for the American Statistical Association – there 21% of visits come from a mac and 14% from linux. Since January, the number of mac visits has grown from 14% I suspect it’s mainly academics and students visiting the site, and this matches my perception that at statistics conferences the number of mac users is growing rapidly. Hadley – Thanks for the alternative POV. Your audience sounds much more like Robert’s. Academics, “real” statisticians, those who use math and graphics for more scientifically rigorous purposes. I would hope that the two camps meet somewhere in the middle, at least to trade ideas and perspectives, if not to actually share analysis platforms. I also wonder if there’s much of a trickle down effect – i.e. the computers that academics use affect what they teach, which affects what people will use in the workplace. I suspect this has a big effect wrt R vs. SAS / SPSS, but I suspect the effect on Excel users would be much smaller. At the local coffee shops, here in the great Northwest, I’m sometimes the only one with a Windows machine, with 5 or 6 Macs at the other tables (and the operators averaging about 15 years younger). I’m amused by the idea that there are people out there going to charting and statistics sorts of web sites on Wii or PS3. It brings up an image of someone actually controlling Excel using a Wii controller. Talk about beating your charts into shape. Well, maybe it is where it is going. I may not be relevant statistical sample, but may be a part of a trend “time-bomb”. 1. Everything I ever wrote has to be re-written (to adjust to the ribbon). 2. They do not like the platform any more (VBA vs Studio). 3. They are going to introduce 2^n versions of Office/Windows to make it downright impossible to handle for a single-person/small business. Of seven PCs we have here, five are still running windows, however I think that two years from now this will go down to two–one being a server. Any new purchases are going to be Linux or Mac. I have been burning midnight oil working with PHP, Python, Adobe Flex/Air and Tibco-gi to figure out a transition to platform-independent software. I may need to re-write a lots of stuff, but not in Windows any more. I promised myself that anything I write, from now on, will not be single OS-supplier dependent any more. Open source people had it right all the time. Still, this may need another year or so to kick-in. I think that I may not be the alone in this move. Just a short hello from your readership in the weeds. And don’t worry. No offense taken. We were discussing this at the Excel User Conference today. Many Mac users (including one conference attendee) are emulating Windows so they can run Excel 2003. Another attendee, a retired college professor, noted that his college got a deal with Apple, so they’ve changed all of their networking infrastructure to be compatible with Macs now as well as with PCs. Many of these Mac users are emulating Windows, which seems to make the upgrade redundant. I’m thinking I should affix an Apple sticker over the HP logo on my laptop, so at least I can pretend to be cool. I’m a Mac guy myself, having a MacBook Pro at home. However, that Mac won’t make its way into your site logs. Why? Because I subscribe to dozens of RSS feeds, and not all are as work-friendly (translation: I can read them and still look like I’m doing work) as yours. So, I read many of the blogs at home (on my Mac), and save some of the more work-ish ones like yours for when I’m at work (on a PC). I don’t prevent Macs from accessing my site (I don’t even know how). Other Macs to visit my site, which is obvious from the presence of nonzero Mac data in this post. I completely missed your point. Now I get it. PS – I hold comments for moderation, which is why the first three didn’t show up. How surprising! A blog devoted to a Microsoft technology primarily used in business settings and primarily on Windows operating systems would garner a larger readership among users of that same Microsoft technology on those same Windows operating systems! You hardly need charts for that one. Lets compare that to the same time last year (2007), shall we? So, on my highest traffic site, Windows lost 4.29% and Macintosh gained 3.33% (3.67% if you count the iPod/iPhone hits), based on this sample. I might go back and see how it trends over time (as I’m an Excel fan who uses and supports Excel 2007 at work). I used to be a Mac (Classic II, then Performa 631). Then, for many years, I was a PC (lots of Dell laptops and Gateway + Dell desktops, Win98, Win2000, WinXP). Now, I have a Dell WinXP PC at work and an iMac at home. I have WinXP available via VMware Fusion for times when I want to run Office 2007, but Google Docs and NeoOffice do the job most of the time. And I do enough Excel and Access work at work that I don’t care to do any more at home. You know what’s funny? Running WinXP via VMware Fusion is, in many ways, superior to running it natively. So, my Mac, at home, is actually a better WinXP box than my WinXP box at work. Thanks for your viewpoint. I should point out that I wasn’t surprised by the results. I was merely doing the analysis to satisfy myself that not creating special Mac versions of my utilities was a reasonable decision. No worries, Jon. I enjoy your blog! And you’re quite right, based on your analysis, that the extra effort would not create much ROI. In my situation, excluding that platform would be unwise. But in yours, it’s quite different. I’m really happy, though, that virtualization software (and hardware speed) has come up to the point that I can run multiple OSes side-by-side and can choose the one I want for the job. I really like the 2007 Office suite, in fact. And I can run it when I need it, even on my iMac. It’s nice to have options. I agree that virtualization is a great tool. I have my main work environment on my XP box, which uses Office 2003. But I use VirtualPC to provide VMs with each of the Office versions in XP, without all the stuff I’ve added to my installation, and without risking any conflicts between shared components of the different versions. For example, my gallery of user-defined charts is completely hosed on my main machine, and I blame concurrent use of Excel 2003 and Excel 2000. Also, on another machine, my Office 2003 installation was hosed by an installation of the Office 12 Beta. Unfortunately my dev PC does not have the juice to run Vista in a VM. I don’t agree about Excel 2007. 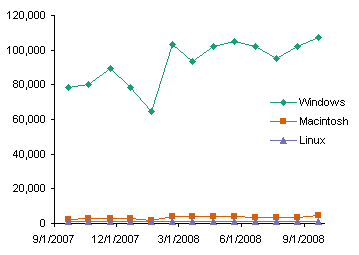 I won’t repeat my comments: you could search the blog for “Excel 2007” to find those.